Have you ever explored the "Mercato Centrale" within Termini station? Still unfamiliar to many, this cathedral-sized venue for food delicacies was inaugurated over a year ago and provides a vibrant focal point for the best street food and market produce the city has to offer. We'll be meeting informally for a drink and... a snack, an aperitivo, a full dinner? It all depends on you. After getting a glass from Luca Boccoli's selection of vintages, you can choose among street food favourites like Stefano Callegari's Trapizzino, Bonci's deluxe pizza al taglio, Roman fried artichokes, or Sicilian arancini and other fried treats. Then there are vegetarian and vegan specialties, Pier Daniele Seu's renowned pizza tonda, cheese boards, fresh fish, hamburgers made with prime Chianina beef, Japanese ramen... Of course, you could also pick up the best possible ingredients to make your own feast at home later on! 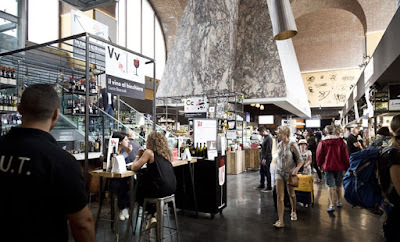 Meeting point: Luca Boccoli's wine bar inside the "Mercato Centrale" -- Via G. Giolitti 36 (southern side of Termini train station); depending on numbers, we may move from the limited seating of the bar area to one of the larger seating areas as participants start getting their drinks and food. Cost: Each pays for their own order(s).